Awful creatures striving to make men their slaves, rise over them, and maybe even wipe them all out. Or maybe they’re just people striving for equality. You can choose which definition you want to use, but it won’t make you right. Lately people have grown a strong hatred towards feminists. People seem to have gotten this notion that so called “feminazis” are actual feminists. I don’t fault them for for this mix up: this is caused solely due to the delusion of these misandrists. That’s what they are. 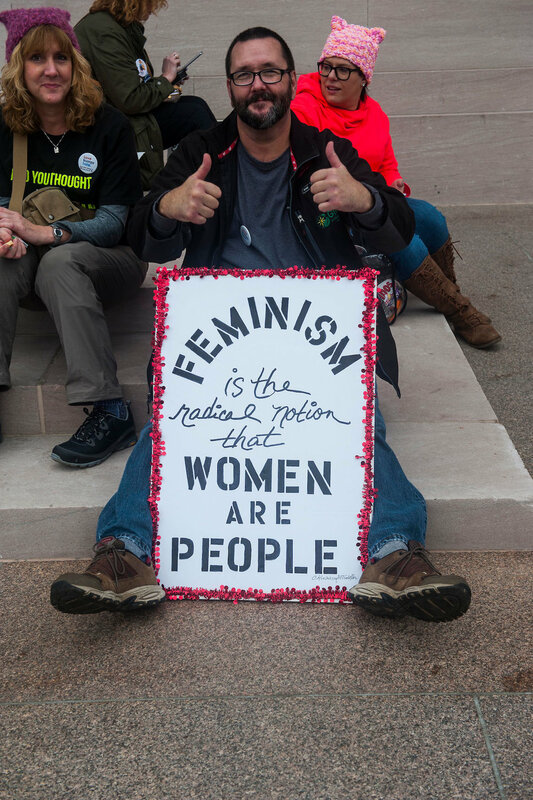 Not feminists, misandrists. So don’t worry: calling yourself a feminist won’t turn you into some man hating monster. Feminazis are not feminists. To clarify this mix up we could look at the definition of feminism. According to the dictionary feminism is “the theory of the political, economic, and social equality of the sexes.”4 A feminazi is defined as “a radical feminist.”3 As you can see through the use of the word radical, which is defined as “political views, practices, and policies of extreme change”5, feminazis take feminism to the extreme, they take it past equality. Taking feminism to the extreme isn’t wanting to abolish stereotypes and erase the stigma around women being the provider in a family, it is thinking all men are inherently evil and believing that women are superior. It is not wanting more equality; it is wanting superiority. Although it might seem like there is nothing more feminism can do besides tear down men, this isn’t true. There are still many issues in society, such as the stereotypes that portray women as emotional, and men as emotionless. Both men and women deserve better than that. There is also the fact that men are expected to be the breadwinner, and that women are expected to be the wife, the mother. Men can be stay at home parents; women can be the breadwinner. Feminism isn’t just about making women equal to men; it is also about making men equal to women. Besides that, it’s about letting people do as they wish, if a woman prefers a more traditional life, so be it. If a man prefers the same, so be it. You do you, but, let me do me. “‘You have to wear heels or we are going to send you home.’”2 This is what Nicola Thorp was told when she went to her job wearing “plain, flat black”2 shoes. She refused, of course, to abide to this ridiculously sexist rule and was sent home. Heels aren’t just uncomfortable: they can be extremely painful. However, Thorp’s neat and professional looking shoes weren’t “feminine” enough, they didn’t make her “pretty” enough. She needed to be beautiful to look at, because otherwise someone might mistake her for a man. Another example of sexism is in advertising. Things such as “half-naked women selling vacuum cleaners”1 and gendered marketing are found everywhere. These gendered products consist of items such as tissues “for men”, or toolboxes “for girls”. We don’t need this. We don’t want this. Feminism does not have a gender. There is no cookie cutter shape for feminism. Your gender or personality has no effect on your ability to be a feminist. You can still be a feminist, because feminism isn’t about hating men. It isn’t only about women. It is about equality for everyone, no matter your gender. Feminism needs men just as much as it needs women, “it is a duty for all people regardless of their gender.”6 Why stand by, idle, when you can help us fight? It doesn’t matter what you label yourself as, everyone is either a feminist, misogynist, or misandrist. If you’re for equality between men and women, you’re a feminist. If you’re of the belief that men are superior, you’re a misogynist. If you’re of the belief that men are inferior, you’re a misandrist. So, if you’re for equality, go ahead and call yourself a feminist, because you are. York Times, The New York Times, 6 Mar. 2018, http://www.nytimes.com/aponline/2018/03/06/world/europe/ap-eu-france-sexist-advertising.html?mtrref=undefined&gwh=5031BD2A87A0350D18DF47533383CBCC&gwt=pay#continues-post-newsletter. Job.” Medium, Gender Theory, 3 June 2017, medium.com/gender-theory/all-men-are-the-enemy-feminist-movements-are-never-just-a-womans-job-b7b0cbfc6002. Make-up to Work’.” The Telegraph, 13 May 2016, www.telegraph.co.uk/women/life/nicola-thorp-high-heels-row-its-sexist-to-insist-that-women-wear/. Anne-Myrthe, this was a beautifully written article on a widely debated and often misunderstood topic. Your informal and firm tone in the this editorial along with your well integrated evidence makes your article very engaging to the audience. Great job and thank you, this had to be said and you did an amazing job! Great article. Love the way you explained how one doesn’t have to be of a certain gender to be a Feminist. How we should look at it from a positive angle; Feminism is about empowering women, not hating men.